When the snow starts to fall our thoughts start to turn to indoor activities. Why not take the opportunity to dust of those skis or try something new! Our Conservation Areas offer cross country skiing opportunities throughout the watershed. This area now offers 6km of groomed cross-country ski trails suitable for beginners to the more advanced. The trails take you through hardwood bush and past a frozen lake and over varying terrain. Admission fees or membership apply. This area has over 10 km of multiuse trails and acres of open frozen lake surface to use for cross country skiing, when conditions permit. Admission fees or membership apply. 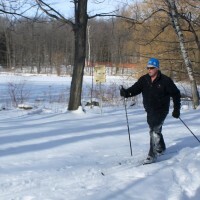 The flat to rolling hills of this Conservation Area allow for great cross country skiing opportunities. The trails in this area not maintained and are designated for multiple uses. Donations accepted at parking kiosk. This linear trail is designated for multiple uses, as a result conditions are usually snow packed. The flat terrain makes it ideal for cross country skiers. Donations accepted at the parking kiosk.